On Tuesday I flew from Detroit to Beijing on Delta’s new A350, which featured their brand new business class with doors at every seat. I shared my initial impressions of the new seat yesterday. The way I see it, this is a great new product, though it’s nowhere close to being as good as Qatar Airways’ Qsuites. Qatar Airways’ business class is more spacious, has much better attention to detail with the little touches, and looks much better. The new Delta One Suite exceeded my expectations. I think it’s the world’s second best business class seat, after Qatar Airways’ Qsuites, and I’d choose this over a reverse herringbone seat or Apex Suite. I was pleasantly surprised by the width of the seat and the footwell (which was my biggest concern), while I was disappointed by the lack of attention to detail in terms of the little touches of the seat, especially in comparison to Qsuites. Several people called me out on that, and after putting some more thought into it, I’d like to revise my stance a bit. While I certainly am not biased in favor of Delta (I give them a hard time quite often due to SkyMiles/their general arrogance), I did draft the post live from my flight, and I think it’s only natural to feel more favorably about a product while you’re on the actual flight, especially when the product exceeds your expectations. Hey Ben, as Clem mentioned I’m a little surprised you would choose this over the apex suite. I seem to remember you being pretty happy with how the space and controls were configured so could you maybe shed a little more light as to why you think this Delta seat is better than an apex suite on Jal let’s say. Or maybe could you just compare the three seats based solely on the hard products and how their configured? Agree with others just don’t see how this beats the apex suite. The apex suite you get about the same amount of privacy when the dividers up, is way less claustrophobic, and there is no confined foot well. Maybe a comparison article on why you think its better would help. For those of you not familiar with Apex Suites, this business class seat is available on select aircraft of Japan Airlines, Korean Air, and Oman Air. It’s one of the most spacious business class seats out there, which is why so few airlines have this configuration. If you look at a cabin with Apex Suites it might not initially look that impressive. What makes Apex Suites so special are the window seats — it’s truly one of the most private and spacious business class seats in existence. Those in window seats have a walkway leading to their seat, and have tons of space as well. You have a big ottoman, when you sleep there’s no footwell in which you need to place your feet, and you have just as much privacy as a fully enclosed suite without having to open or close a door. The downside is that in most configurations, only about a third of the seats in an Apex Suite configuration are window seats, so most passengers will fly in Apex Suites and not have that experience. Still, I’ve never had an issue selecting a window seat in this configuration (even if booking last minute), so I think it’s fair to judge based on the window seat. After all, every cabin has some seats that are better than others. So I apologize, I may have been a bit too excited about the new Delta One Suite. It’s a great seat, but I don’t think I’d choose it over an Apex Suite. I do still think I’d choose it over a reverse herringbone seat, though. Now that I’ve tried just about every business class seat out there (including the recently introduced seats from Delta, Qatar, Singapore, and United) I think it’s time for me to do a full ranking with the world’s best business class seats. What do you guys think? Is the Delta One Suite the next best business class seat after Apex Suites, or is that still being too generous? Since Delta is better than 2/3 of the Apex product, your first opinion is still valid. A ranking of Business Class seats would be extremely helpful. The timing is right for me as I’m trying to decided between an international business class seat on American or Virgin Atlantic. It might not be comparable or better than other international airlines but Delta’s business class overall experience is way far superior than AA or UA. I’m generally not a fan of reverse hereingbone seats, ESPECIALLY on Cathay/American. I think being further from the window is already bad enough, but the swivel IFE screen sort of makes it feel “cheap” – so JAL has the right idea with the Zodiac Cirrus but with fixed screens and no tray table blocking your knees. I want to be closer to the window whenever I book a window seat and would prefer to have something between me and the aisle. I’d take a staggered configuration (JL 767, EY, NH, GA) any day over reverse herringbone and push for my luck with the window seats. Ben, thank you for your honesty and willingness to admit to initial over-exuberance, instead of digging in. Its a great seat, as you say – but still not in the same league as ME and Asian carriers. I look forward to your overall ranking of business class seats overall. 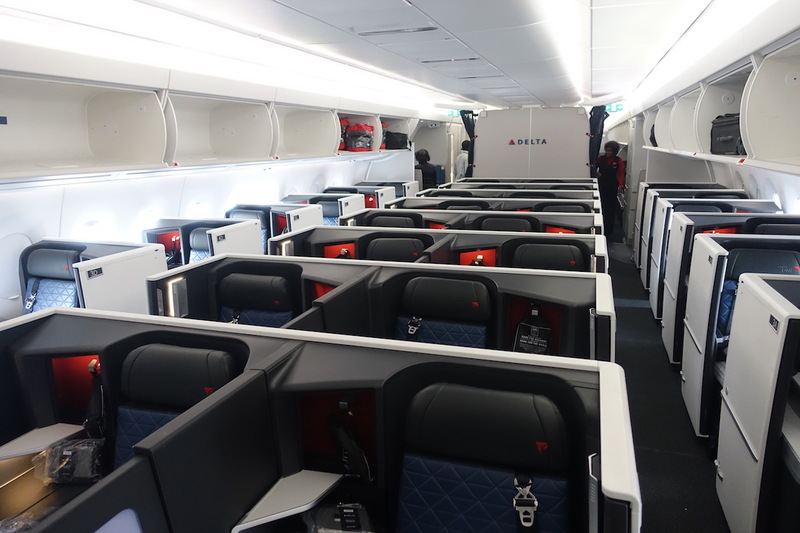 Lucky, hypothetical question, would you prefer flying the Delta One Suite or the Jetblue Mint Suite on a transcon? You really need to review the Qantas 787 Business Suite. It is the same to the Delta suite (Vantage XL) but without the door, and arguably nicer finishes. Then, I think you could rank the Business Class seats. I’m thinking it would be funny to write a post saying, “In short, I’d take Spirit Airlines’ pre-reclined economy seats over any seat on United metal in economy.” Just see how people react. In all seriousness, I too have been swept up by shiny new airplane seats and overlooked the defects until I had time to sleep on it. How would you rank these if you included consideration of cabin temperature, which is routinely better (for Westerners) on a western airline? If you do a full business class roundup, please include this information as it’s pretty critical for overall comfort on a long haul flight. I didn’t like how the Apex Suite had essentially no storage space while in bed mode. It’s great for sleeping though. I just have to say that the Korean Air Prestige Class in the upper deck of the 748 is a must. Apex Suite has ZERO storage space. There is no place even to put your phone or glasses or book. For this reason alone, i don’t see how it can rank as one of the top products. When you said second bet business class I took it to mean seat only, because we all know that JAL and SQ have far superior soft products in business. I mean the food on American carriers in general shouldn’t even crack the top 10. I’ve not flown the Apex seat but from the photos it appears to be an update of the horridly inadequate BA Club World seat with next to no elbow room or storage space. Can’t see how anyone could consider that superior to any of the other current seats found on SQ, CX or AA though suspect it comes down to the foot well for many people. I still prefer the angled seats like on AA. These seats (including the new QF Business) too much of your body is under the armrest in front. I find these too confining. HELLZ YEA BRO i love your comparison/lists articles. No way is the delta suite the second best B class seat. The Sky Suite on JAL 787-9 is better as is the B class seat on SQ 777-200s. That seat has much more room, secure storage and converts to a larger and more comfortable bed. That seat is just a notch below first class in terms of space,comfort and looks. I also prefer the B class seat on QR A350-900. Super Diamond seats have much better storage. I hate the tiny armrest by the window on the Dl A350. It is just hard plastic and its height, which is unadjustable, was particularly annoying. Sleeping with my feet in a small space under the console of the seat in front is too restrictive. The best parts of the DL “suite” is the color scheme and the large HD video screen. Can you elaborate and state exactly what your top five business products are and also first class. Please base this soley on hard product then perhaps another listing soft product. Can someone’s help me out in suggesting which seat I should select for my mother on Cathay res verse heringbone from Vancouver to Hong Kong, flight 795. She is in her mid eighties, does not like to fly, and suffers from mild claustrophobia, and is of above average hight. The claustrophobia is the major issue — she hates to go on elevators. I imagine that she will sleep and read for most of the flight. Her son and his wife will also be on the flight, also in business and she will want them nearby. I wouldn’t choose an Apex window seat over a Delta One or reverse herringbone seat. Even with a partition, you’re very close to your neighbor. Maybe free champagne and logic are not very compatible! KE apex suites and CX reverse herringbone seats for life…. Also, lucky was it the door in the Delta One or were you too excited about the Delta one….. I slightly prefer reverse herringbone seats by CX(as mentioned above) more…. Lucky: even if this post reads you still preferring DL1 over Apex, I’ll still consider a valid OPINION given what you value most in the product. You laid out a pretty compelling case in your previous post even if it was written in the heat of the moment. Don’t let us commenters bat you around too much! Lucky, I would appreciate understanding your aversion to reverse herringbone. On your own analysis the Virgin Australia seat you rated very highly, the CX business seat runs rings around many in the market. Being couped up in a tiny seat with a door on it would feel like a jail cell for mine. I have to say the DL product and the Advantage seat don’t float my boat one bit. Once you do enough long haul…by that I mean SYD-LHR you are happy to get out of the plane, never mind being couped up in an enclosed seat for that time! Not sure I agree temperature is the most important; everyone has a different ideal. I’d rate individual air nozzles more highly – giving you some control of your environment. Personally I find European airlines too hot, and mist have phased out nozzles. Qatar, for instance, is hotter, but every seat has at least one nozzle – Qsuites have two. You are spot on! Temperature should be included in all reviews. Should be an actual numerical reading, since travel process can be stressful which can alter the “how you feel” temperature. I fly KE J from SEA-ICN 4-6 times a year. I’m a hair shorter than you, and find it impossible to sleep because the bed length is so short. Do you simply stay awake for your flights in an Apex Suite? I agree that the privacy is amazing however. I agree with @cariverga regarding the apex suites. I flew F on the window with Korean Air from ICN-YYZ in June. I honestly didn’t know it was the apex suite until right now, however I immediately noticed there was absolutely ZERO storage space at my seat. I have never been more frustrated at a lack of storage on a plane ever. I just couldn’t believe F had nowhere to even put my phone or ipad… So for F I was disappointed, though I could see it being a very nice business class seat, but it needs more storage! I have searched your site and could not find the review on Delta’s new Delta One Suites on the A350. If I recall properly, you flew this back in February. When can we expect the review and Trip Report? I have flown every business class seat configuration there is. I’m a Diamond member with Delta and have flown there A350 business suites. My #1 preference is Singapore A350 business much better than Delta.